Anne Zahalka, The Mallee, near Benetook in Sunraysia Region of Victoria, 2019. Archival pigment ink on rag paper, 80 x 80cm. Courtesy: the artist and ARC ONE Gallery, Melbourne. The term Anthropocene describes an ecological turning point where the impact of human behaviour has significantly and permanently affected our planet, contributing to drastic changes on climate and the environment. 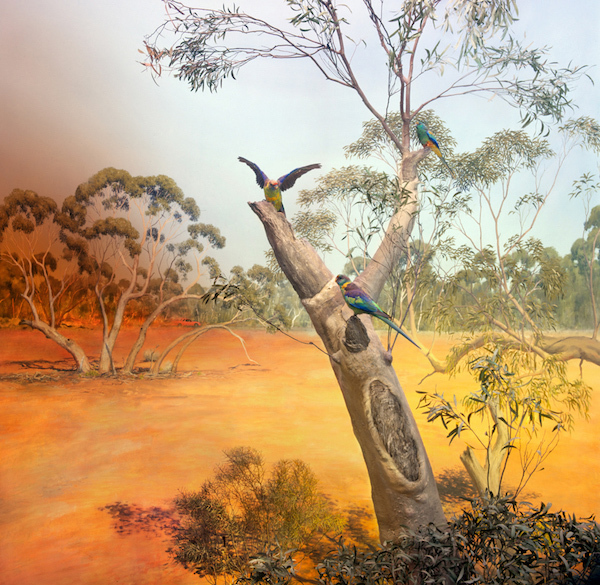 In response, Anne Zahalka presents Wild Life, Australia, a reimagining of early Australian dioramas from natural history museums that mark out unsettling ethical and environmental issues in this country. Re-working these contrived ‘habitats’ to acknowledge First Nations people and the impact of colonisation, Zahalka reflects on the permanent altering of the Australian environment within the age of the Anthropocene. This exhibition is part of CLIMARTE’s ART+CLIMATE=CHANGE 2019 – a socially-engaged festival of climate change related arts and ideas featuring curated exhibitions and theatre works alongside a series of keynote lectures, events and public forums featuring local and international guests.